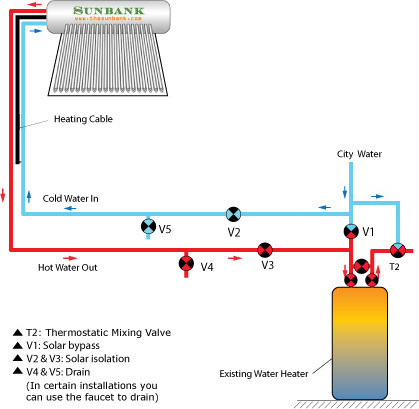 The pre-heater configuration means that the Sunbank heats the water before it goes to your conventional water heater. This is an installation configuration that is plumbed with valves that allow you to bypass the conventional tank. 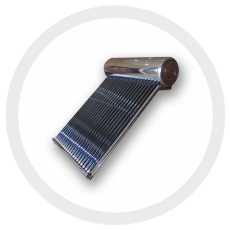 This gives you ultimate flexibility and will come in handy when your conventional water heater fails. You can then bypass it by switching a couple of valves and have hot water again while avoiding hundreds of dollars in replacement costs. The pre-heater plumbing configuration is right for those who already have a good conventional water heater or do not have enough Sunbank capacity installed to supply all of their hot water needs. This could be because of high hot water consumption, installation site limitations, budget limitations, or climate and lack of solar resources. The pre-heater configuration means that your existing water heater will be re-supplied with hot water instead of cold water. This arrangement allows your electric or gas heater to work much less which will help it to last longer, saves you money and increases your overall storage capacity.